Hammers cage is 60 gallon. I use wood chips at the bottom. his uv lights are made from zoo med. The basking light is 100 watts. im not sure what the tube light is. i dont have a thermometer. bad, i know. I feed him read leaf lettuce, romaine, collard greens from a bag. (Which he for some reason doesnt like anymore), rasberries, strawberries, grapes sometimes for a treat. She was talking about the winter when she said he might be cold. She just said to give him drops and take him outside as often as i can for sunlight. I bought him a new uv basking bulb. he seems to like it. I fed him baby food with a syringe and he did pretty well. ( Sweet potatos and pears) and gave him a couple of calcium drops. w out D. She also said he is getting old and may be letting go. Do you mind telling us where you are from? When was the last time you changed out the light bulbs on the fluorescent tube? You want to stay away from lettuce because it's not as good as other greens. In the long run the lettuce will take its toll. Try greens like escarole, dandelions, mustard greens, and turnip greens. You can also take some squash like acorn squash and butternut squash and give it to him, be sure to chop it up finely. Maybe he might have swallowed some of the woodchip and thats causing him to not eat because it hurts. Im not sure how to figure out if he did, but maybe a vet can find out. I would highly recommended a bigger enclosure other than the 60 gallon you have, it is a bit small. This is where you are going to have to custom build a very big enclosure for him. Also, has he had any other issues during his life? 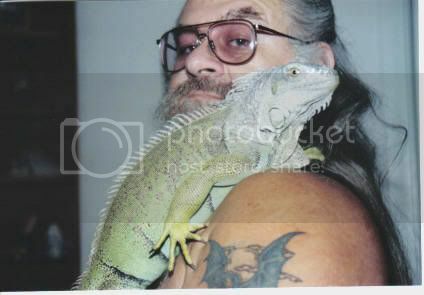 It might be worth looking into getting the vet to do some bloodwork on the Iguana. Pictures of Ig and cage would be great if you could get some posted. How big is your Ig Snout to Vent and Snout to Tail? Does the cage get colder in the winter? Is he free to roam the house? Can you be a little more specific on the new UV/Bask light? At 16 yrs. old he lives in a 60 gal. tank?? 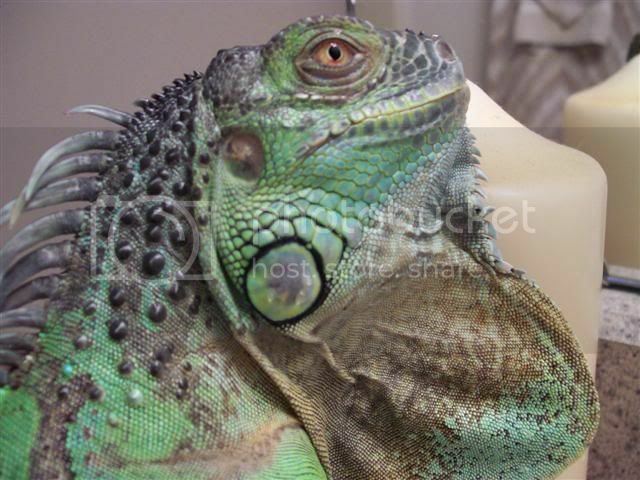 The MINIMUM for an adult iguana is a custom built 6x6x3 enclosure. A 60 gal. is fine for a baby just over a year old...but no more. These can cause impaction issues by getting lodged iin the intestines. The only way to find out is done by x-ray. Your vet should have suggested this. Loose particulates like this do not belong in iguana set-ups. The risk of deadly impaction runs too high. his uv lights are made from zoo med. im not sure what the tube light is. 5.0? 10.0? It will say right on the bulb where the stamp is. The basking light is 100 watts. If you know this is bad, then why haven't you fixed this? When temps are one of THE critical care areas in reptile care...a cost of $11.88 for a good thermometer from walmart is an easy fix. Your diet has needed a huge revamp for a long time if this is what it consists of. Take a look at the sticky note in this section. It is truly amazing you have an ig who has lived 16 yrs under these conditions. I'm not slamming you...honest...but I wonder how much better he would have felt with a quality-based set-up and the correct care requirements in place. Yes...I think the vet should have splinted the leg. Was a blood panel done on him? WOW, that was quite an A chewing. When I bought the iguana at the pet store this is how they told me to take care of him. They said make sure he has a vita lite, a basking light and feed him veges and fruits. collard greens and such. When I go to the reptile place, all their ig have lettuce and the same things i feed mine in there cages. So, I really didn't think I was feeding him badly. And he's not always in his tank. I let him out and he cruises around the room. I'm not sure whats good to put at the bottom of the cage. Again, thats how they had the cages set up at the pet store. The Vet did take an x-ray. That's how she saw the leg fracture. I'll take him back and have her put a splint on it. I've been feeding him some baby food for now and some calcium drops. He's eating it well. I feel really upset after reading you comment. I know that wasn't your intention. I didn't know I was doing anything wrong. I'll get him a new vita light too. (is 10.0 good? )And a thermometer. Just to be sure, what is the temp suppose to be? And what should I get for the bottom of the cage? I'll tell the Vet to do a blood panel too. I do apologize for being so brusque. Let's see if we can fix a few things. First - never trust a pet store for any kind of animal care. Always do your research on your own - no matter the animal. Sometimes they're right...most of the time they're not. Substrate - Particulates such as bark, mulch, sand, etc...can cause fatal impaction by accidental ingestion. Ig tongues are sticky - and if food is knocked out of the plate onto the particulate - pieces of bark come with it. This stuff can also get caught back up into the vent while the bum is being dragged across the bark. It also harbors bacteria. Newspaper, reptile carpet, astroturf, butcher paper are all good substrates to use. The one I would promote of the second and third one of the Merc vapors would be the MR SB one. T-Rex was given permission by the guy who designed the bulb so it's exactly the same thing...different packaging. I would stick with purchasing from the guy who designed them and uses the money he makes off of his design to rehabilitate reptiles. 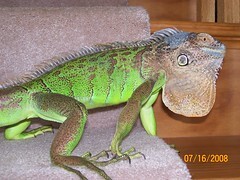 Many of the other bulbs can be purchased at www.reptiledirect.com for a more reasonable price than the pet stores. Stay away from anything that is a spiral. Once you provide these lights for your ig...set them in the 6" - 8" range from their back for the florescent tubes and 12-18" on the Mega Rays. Any farther and the UVB drops of so much that they don't do any good. Diet - Very important for good quality greens added with a variety of other veggies for the nutritional needs. Lettuces are empty foods with little to no nutrition. Some foods block calcium and iodine, while some are just plain toxic. There are literally dozens of variations. Make sure you take out the main stem from the greens leaves. You can discard them, feed them to a dog, rabbits or guinea you may have. Even parrots will benefit from these...or if you have a food processor you can chop them very small like the green beans and add them into the main salad. You can also add them to the compost pile. Since you boy isn't eating well on his own...I suggest ditching the baby food and blending a homemade slurry combining the first three greens, parsnips, green beans, and a smelly fruit such as mango or cantaloupe for appeal and smell. Blend it all in a blender adding water as needed to thin it down for syringe feeding. Add the calcium separate as you're doing now. A blood panel will tell the vet and you a lot of things. The biggest right now would be kidney function (his symptoms suggest it's possible he may have problems here). And in all due fairness, at one time, the vita lite was all there was and it was suggested for use. But that was a loooooooong time ago! Like 20 plus years! There are much better sources now available. They set up their cages using the stuff that they sell. Customers see it used in the store cages and assume that is the the way to go. And then buy the stuff from the store. Back in March I first posted a question wanting to find out why my 16 yr old iguana (Hammer) was not eating. I actually figured out he's almost 18 by the way. Just wanted everyone to know that with the help of the kind people from this site he has made a complete recovery. When I wrote he had not eatin in a long time, he had a fractured leg and looked like he was about to die. I took him to the vet who wasn't much help. But, when I started taking the advise from some of you things started changing slowly but, surely. I blended all the foods you told me to and fed him with a syringe. I also was feeding him critical care food. As much as he would eat. I changed all his lighting, gave him calcium and lots of TLC. He looks better then ever and eats like a pig now on his own. Thank you for being there for me and Hammer. You helped me save his life. I'll be forever grateful. I'm determined to get him into his mid 20's. reesee! I'm so glad you let all of us know how well he's doing! I can't wait for his 20th b-day! You will need to make him a little souffle! You can actually do this with pureed salad and use a product called agar agar. It's a great way to do something special for him. I haven't made anything with mine yet...but I do have some. It's a natural, flavorless gelatin. I get mine from www.baskinglizards.com . I'd like to post a pictue of Hammer but, i can't figure out how. Could someone tell me how to do it. Id like to post it as my member pic too.